Today there is no real recipe to share. 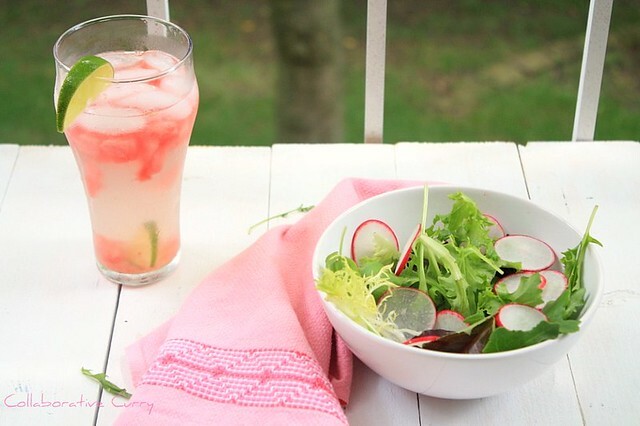 It is just about how I make radish salad and lemonade. It is a refreshing lunch option. Easy to put together and good on your love handles it is great to take a break from heavy food. The other day on facebook, there was a discussion on “bloggers putting on weight.” I am in the category of people who do. It is probably because of so much cooking. And to top it, when something does not turn out well you still end up eating it and making the dish again. Assuming these repeated dishes are calorie rich you end up consume way more than your body can take. 1. 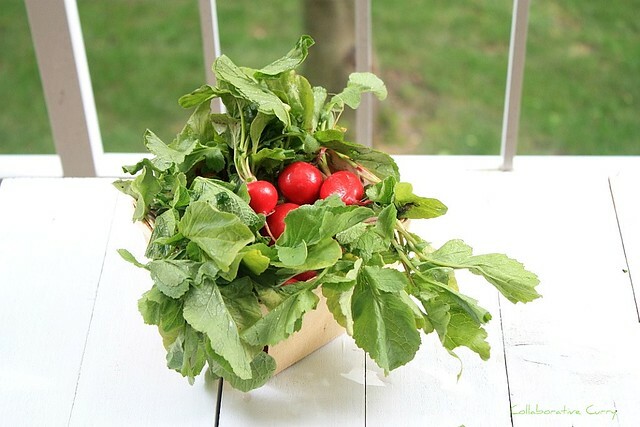 Scrub clean a bunch of radishes. Trim the roots and leaves off. 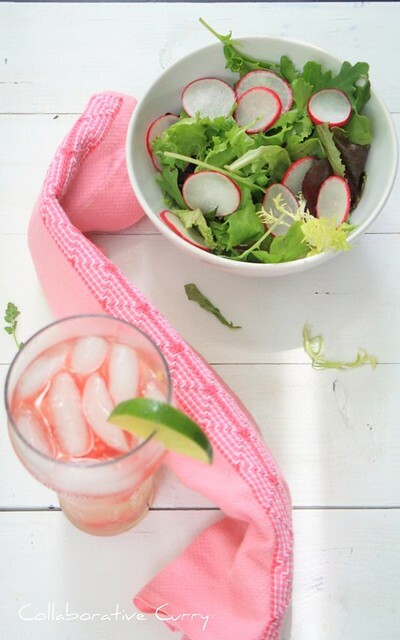 Slice the radish into thin rounds and place in a bowl and immediately squeeze half a lime over it. Add salt to taste. Serve it over a medley of spring greens. I prefer to buy the mixed greens to plain lettuce. It packs more flavor into the salad. 2. Radish has a bite to it. It was not my favorite flavor but with lemon it is pretty good and it reminds of red onions. It is not the same but I am saying it has this bite but overall it is a pretty looking salad and I quite like it now. 1. Squeeze a lime into a jar, grate ¼ inch of ginger in, add a dash of salt, sugar to taste and mix well. Strain to remove shreds of ginger or lime and pour over ice. Make small cubes of watermelon and top the drink. Slice an lemon rind and place on glass. 2. The color is pretty and a great drink. This entire meal is quite good for your stomach. Go easy on the sugar to make it even better. With one like you should be able to make 2 glasses of lemonade. If anybody needs more lemon flavor you can always squeeze the rind used as garnish. Agreed very refreshing and healthy combo..looks very tempting!!! Even I am putting on weight. This salad looks great and is very very healthy. You have done amazing photography, I am really tempted now. 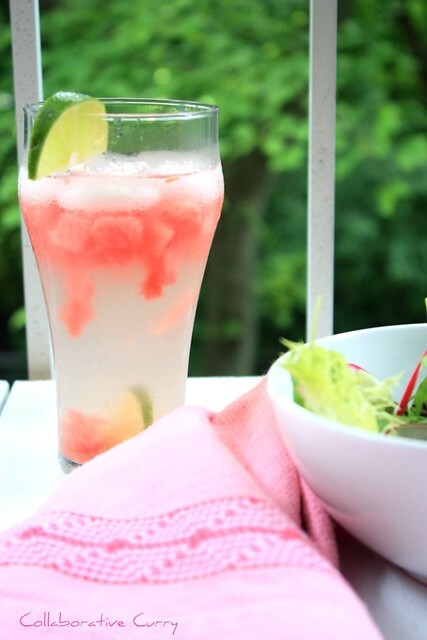 Seriously the lemonade and salad looks refreshing and prefect for this summer.. Very colorful and vibrant looking salad Sunitha. Excellent preparation. Lovely salad and lemonade. Both of them look awesome. aaah..such a simple fresh salad! Thats so true about eating the food even if it's work out that well. For me it's more about all the blog hopping I do which keeps me hungry most of the time. I too have started on salad and very light meal :) This is an excellent salad. and the lemonade is just perfect with ginger and lime. It looks very refreshing and healthy too. I would love to have a daily dose of this after my coolsculpting treatment.